Much has been written on the topic of spiritual gifts by both cessationists and continuationists. Enter Spiritual Gifts: What They Are & Why They Matter, written by a continuationist turned “nuanced cessationist,” Thomas R. Schreiner. Schreiner is a leading New Testament scholar and the James Harrison Buchanan Professor of New Testament Interpretation at The Southern Baptist Theological Seminary. Although Schreiner is a New Testament scholar, he writes Spiritual Gifts for the person in the pew who desires to gain more insight into spiritual gifts without having to wade into the exegetical minutia of an in-depth, scholarly treatment of the topic. Schreiner begins Spiritual Gifts by stating he writes the book not only to support “a kind of cessationism” but also to “sketch in a theology of spiritual gifts.”1 He acknowledges that the issue of cessationism can easily become polemical and divisive, but as is typical for Schreiner, he desires to approach this topic humbly and irenically. It is not surprising then that he dedicates the book to Wayne Grudem, John Piper, and Sam Storms—three notable continuationists. Perhaps one of the most debated topics among modern Christians is the subject of New Testament (NT) prophecy and tongues. Many believers in our day are raising the question, “Are the New Testament gifts of prophecy and tongues still for today?” This isn’t just a modern question. It’s been raised from time to time throughout the history of the church. In the early church there were different responses to that question. For example, the early church fathers Irenaeus (c. 130-200) and Tertullian (c. 150-212) both refer to ongoing manifestations of prophecy and tongues in their day (i.e., 2nd and 3rd century). On the other hand, both Chrysostom (c. 350-407) and Augustine (354-430) argue that the gift of tongues had ceased by their time (i.e., 4th and 5th century). There are four major biblical contexts that discuss what we commonly refer to as ”spiritual gifts.” In chronological order, they are 1 Corinthians 12-14, Romans 12:1-8, Paul’s Letter to the Ephesians, and 1 Peter 4:10-11. It is notable that the explanations of spiritual gifts become increasingly simple as the New Testament progresses. 1 Corinthians 12-14 provides a very detailed discussion, especially of revelatory and sign gifts. Romans 12:1-8 builds on the grounding of the previous eleven chapters, and considers how gifts contribute to the overall functioning together of the body. Paul’s Letter to the Ephesians focuses in the first three chapters on how the believer comes to have every spiritual blessing in the heavenlies in Christ, and what are the implications of those blessings. In the remaining three chapters, Paul challenges believers to walk in those blessings. Throughout the letter, Paul emphasizes the role of the Holy Spirit in the life of the believer. Finally, in 1 Peter 4:10-11, Peter offers a very simple formula for the use of gifts and their purpose. If there is one distinguishing mark that separates the New Calvinist from traditional Calvinists it would be the openness of the newer variety toward the charismatic gifts. While many, if not most, would not see themselves as charismatics in the conventional sense, they believe that all the gifts of the Holy Spirit are operational today, including the sign gifts such as miracles, tongues, interpretation of tongues, healings, and prophecy. While most draw the line at apostleship, seeing it as an office reserved for a handful of appointed New Testament leaders who founded the church (Eph 2:20), strangely they see the gift of prophecy as still viable. Following the leadership of Wayne Grudem, in his landmark book, The Gift of Prophecy in the New Testament Today, as well as his Systematic Theology, many have been convinced that New Testament era prophecy is not held to the same standards as Old Testament prophecies and prophets. Whereas Old Testament prophecy was to be without error, with the consequence of the execution of the prophet if one prophesied falsely (Deut 18:20-22), church age prophecies can often be a mixture of truth and error. From the Archives: Are There Two Levels of NT Prophecy? Did all the miraculous gifts of the Spirit, such as tongues and prophecy, cease with the completion of the New Testament? If we take the position that prophecy continues in some form, is such a view compatible with the conviction that God has given us all the authoritative revelation He intended to give (that the canon of Scripture is closed)? 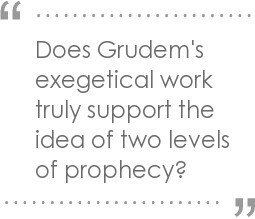 Since Dr. Wayne Grudem’s work has been foundational for many who believe in a continuing gift of prophecy, Compton’s paper focuses on Grudem’s view2 that the NT speaks of two levels of prophecy: apostolic and non-apostolic. Grudem maintains that apostolic prophecy was authoritative and inerrant in the same way that Old Testament prophecy was and that this form of prophecy ceased when the NT Scriptures were completed. Read more about From the Archives: Are There Two Levels of NT Prophecy? 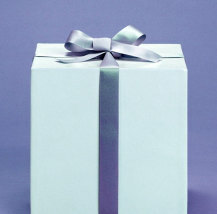 Does Every Believer Have a Spiritual Gift? Finally, in 1 Timothy 4:14 Paul warns Timothy not to neglect the spiritual gift within him. In light of the limited number of references in the NASB (five), and the even smaller number of actual references in the Greek (two), there is no biblical data to support the idea that every believer has, specifically, a spiritual gift. On the other hand, there is data that supporting every believer’s having a manifestation of the Spirit for the common good (1 Cor. 12:7). Read more about Does Every Believer Have a Spiritual Gift? In discussing the unity and maturing of believers, Paul describes in Ephesians 4 how God’s comprehensive and unified work results in grace for each individual believer (Eph 4:7). Each of us can rejoice, knowing that God has given us individually the grace we need, while at the same time we can understand that we are not independent of Him nor of each other. We are designed to function as His body—as one—even though we are individual members of His body. Considering the unique source of grace and the gifts that stem from grace, Paul explains that Christ gave the gift (4:7), and He gave gifts (4:8). His grace included not just the singular gift of salvation (as described in Eph. 2:8-9), but also everything necessary for complete sanctification (as described in Eph. 2:10). Ephesians 4:11 identifies four vital gifts: “and He gave indeed the apostles, and the prophets, and the evangelists, and the pastors and teachers.” This is a literal translation accounting for each Greek word in the passage. Notice that the objects of verb gave are preceded in each case by the definite article the. Also notice the passage does not say that He gave the gift of apostleship, prophecy, evangelism, and pastoring and teaching—if that is what Paul intended to say, he could have easily structured the passage to make that meaning clear. Instead, he identifies the gifts as the apostles themselves, the prophets themselves, the evangelists themselves, and the pastors and teachers themselves.